A dog-clutch makes threading much easier: no messing around with thread-dial indicators and, most importantly, no worrying over whether you can stop the machine before it reaches the end of the threadable area. My design is based on John Moran's one, described in detail on his website. The clutch itself is very similar to John's design; the only significant difference being that I converted it to metric (although as the lathe is inherently a metric machine, most of the dimensions shown by John are simply an imperial conversion of a metric measurement: e.g. 0.276" is the imperial equivalent of 7 mm). Also visible in the photo above is my simple threading banjo and my simple spindle extension. This photo shows all of the parts that make up the clutch mechanism. Running from left to right a long the top, these are: an M5 gear retension screw and washer, gear A from the selected change-gears, the idler, the clutch itself, the main shaft, the transfer gear and the circlip that holds the transfer gear in place. Beneath these in the photo are the modified mount, the shift lever, a tap-washer that is used as a rubber spacer and the support screws that replace the M5 cap screws that hold the mount on the standard machine. The idler is turned from 1/2" mild steel. For most of its length it has an outer diameter of 12 mm, but a 1 mm long section is left at 1/2" diameter 5 mm from the inner end. the total length is 14 mm and it has a 7 mm hole all the way through. The keyway is 3 mm but doesn't reach the ends of the idler to ensure that the key doesn't eject itself from the idler. The clutch is turned from 20 mm mild steel. I originally made this from brass (as per John's website), but I think I made the inner end too thin and it broke fairly soon after starting to use it, so I remade it from steel and thickened up the inner end. It is 5 mm long in total and has a 1.6 mm (1/16") groove cut 1.5 mm from the inner end. The groove is 1 mm deep, so reduces the outer diameter to 18 mm in this section. The clutch has a 12.2 mm bore and 3 mm keyway. The main shaft is, in total, 41.5 mm long. The right-hand end is 7 mm diameter and 7 mm long. The keyed section is 12 mm diameter and 11 mm long with a 0.5 mm deep groove a little over 8 mm from the left-hand side as shown in the picture. This is for the circlip that holds the transfer gear in place. The central body section is 15 mm diameter, 6.5 mm long. Immediately to the left of the central body section is a 2.7 mm long 12 mm diameter section with a 3 mm hole cross-drilled to just over half-depth. A piece of 3 mm HSS tool-bit is used as the dog and is glued into this hole. The shaft on the left (on which the idler runs) is 6.95 mm diameter and 14 mm long. 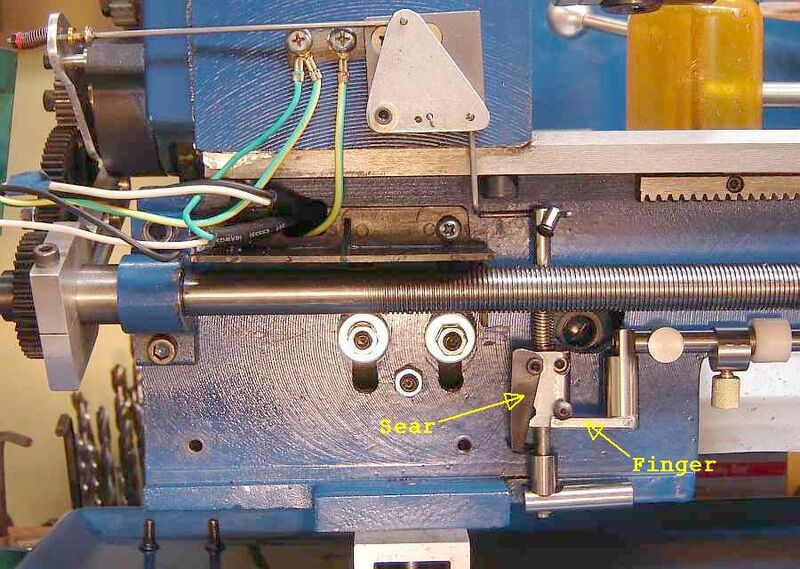 There is an M5 hole tapped in the end for the gear retension screw. The shift lever is made from 3.2 mm aluminium plate. The overall size is 92.5 mm × 44 mm, although the dimensions are certainly not critical. The large hole in the centre is 22 mm diameter, but has been enlarged lengthwise to 28 mm long. The pins that engage with the groove in the clutch are 1.2 mm piano wire, as described on John's site. The clutch mechanism is shown assembled above. On the left, the clutch is disengaged and the transfer-gear can rotate independently of gear A. On the right, the clutch has been engaged and the two gears are now locked together. This animation of the dog-clutch operation (created with v0.15 of the free, but not yet complete, 3D CAD application FreeCAD) may help with understanding how this works. It will need a relatively modern web-browser to work (if you have problems, try Google Chrome or Mozilla Firefox); if you can't make it work you can download it here and play it with something like the VLC media player. Sorry, your browser does not seem to support this video. A 9 mm thick 38 mm diameter steel disc is used to translate the horizontal movement of the shaft into a vertical movement of a piece of 3 mm mild steel. As the linkage (in the right-hand photo) is moved to the left, the disc rotates clockwise and pulls the 3 mm wire downwards. The disc has a 10.5 mm hole through the middle (the dimension was chosen because I had a piece of 38 mm steel with a 10.5 mm hole in the middle already!). There are two other holes in the disc, at 90° from one-another: one is tapped M5, the other M6. The M5 hole (on the right of the photo) holds a short piece of 6 mm mild steel, with a section reduced to 5 mm and tapped M5. It is cross-drilled 3 mm for the linking wire, which has an M3 thread cut on the end for two nuts. It is fitted into the disc very loosely so it can turn freely as the disc rotates. In these images, the disc can be seen more clearly. The left-hand image shows the 6 mm connecting piece loosely fitted on the right-hand side of the image. On the right-hand side of the right-hand photo, you can see a piece of 10 mm steel attached to the disc with an M6 cap-screw which has had the head reduced in diameter to less than 10 mm. This engages with the slot in the component fitted to the main shaft. The shaft that the disc rotates on is 15 mm diameter 20 mm long. A 9 mm long section is reduced to 10.5 mm for the disc to run on. The hole through the middle is 6 mm for the M6 mounting screw. The length of the shaft was chosen such that the 3 mm wire clears the lead-screw. The second part of the trigger mechanism is a piece of 3.2 mm aluminium saved from the scrap bin. It pivots on an M6 screw and has two 4 mm holes (one of which is 45 mm from the pivot and the other is 15 mm from the pivot) for the 3 mm wires that connect the parts of the trigger mechanism together. The sliding adjustment piece shown in the left-hand photo is 20 mm diameter and 40 mm long. It has an 8 mm hole drilled through for the shaft and two M6 threaded holes cross-drilled at 10 mm and 25 mm from the left-hand end. It is used to set the position at which the dog-clutch disengages. To actuate this sliding adjustment piece, a large block of steel is bolted to the bottom of the carriage such that the carriage will push the adjustment piece to the left and disengage the clutch. Like John, I've found that this dog clutch makes threading considerably easier and is extremely repeatable. I no longer worry about making sure I have a long run-off section after the thread to give me time to stop the lathe. This also means I can run the lathe faster than I would have done when there was a risk of overrunning. I wish I'd made this change a long time ago and feel it should be an integral part of any screw-cutting lathe.